and that’s why I haven’t posted lately. Really. It’s not because I’m a total slack-a#$$. But since the MakeBakeMother abandoned me for Christmas (due entirely to loving the other MakebakeSisters more than she loves me, I’m quite sure) I gave her a pressie already so I’ll show it off now. I made this using a pattern on Ravelry as a base, the pattern is called Solstice Hat. 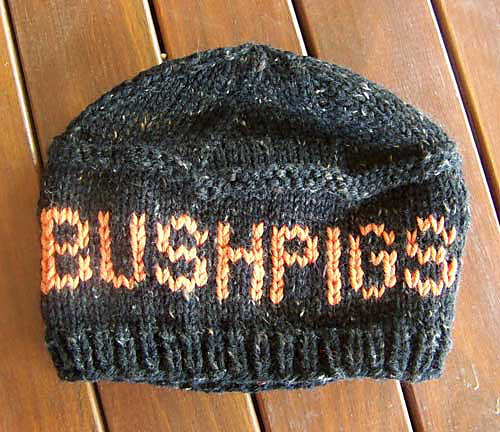 I knit the patterned band around half of the hat, but I altered the pattern to a chart of the word Bushpigs for the other half. The Bushpigs are a rugby team. Just in case you were starting to think I am really mean to my mother. I did try charting pig shapes but this worked best at the time. Here’s my Rav project page with a few pattern alterations in case you are interested.